Can the Runner avoid the tag from Authenticator and still bypass it? If the Runner avoids the tag, then they have not paid the cost to bypass Authenticator and therefore do not bypass it. If Jesminder Sareen has not previously avoided a tag this run and encounters Authenticator, can she bypass it? No. Her ability is mandatory, so she cannot pay the cost to bypass because the tag will be avoided. A cheap but taxing porous code gate in the Eli 1.0 category of ice. 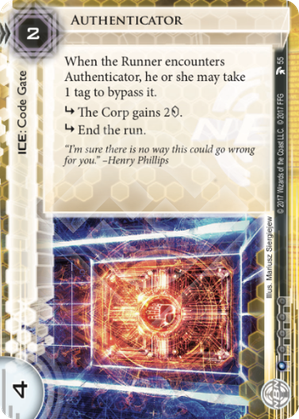 For a cheap cheap cost of 2 and at 1 influence you get a code gate that stops the runner and gives you back its rez cost to boot unless the runner either breaks it or takes a tag. Against non-special-requirements decoders other than Torch it takes at least 3 to get through the ETR and often 4 to avoid giving the corp 2. That's not bad for a piece of 2 ice. So what about the bypass? The cost is one tag. Without things like Aaron Marrón it takes and 2 to get rid of that tag. That's still decently taxing for a 2 piece of ice. With Aaron the bypass becomes free but Aaron counters are a finite resource and especially in the early game when Authenticator is at its best they're probably not available yet. The runner could of course float the tags but that's always risky, especially if the corp playing Authenticator is NBN. Even if you clear the tag immediately afterwards there's an element of risk due to cards like Zealous Judge. Authenticator is clearly NBN ice. It's taxing but porous. It won't stop the runner on individual high value runs (The Maker's Eye, last-chance runs) but over the course of a game it will slow the runner down while being very affordable itself.